I'm pissed by UOB Bank. what are they thinking? i received a credit card statement few days ago..and a funny things to hear about UNACTIVATED Charges... it seem like UOB trying to ROB ppl. wait... i only got Citibank and Maybank Credit Card what? what bank geh card is it? then i found it is UOB? aiks?? UOB? aer you kidding me? since when i owned a UOB Credit Card? and since when i USED UOB Credit Card? something wrongs here! UOB : "what can i help you?" DON: "i received a credit card statement, may i know where ther RM456 come from?" UOB : "may i know your card number sir?" DON : "erm.. i don't know.. where does it written on?" UOB : "On your Card sir, the 16 numbers on your card"
DON : "i don't have a UOB Credit Card." 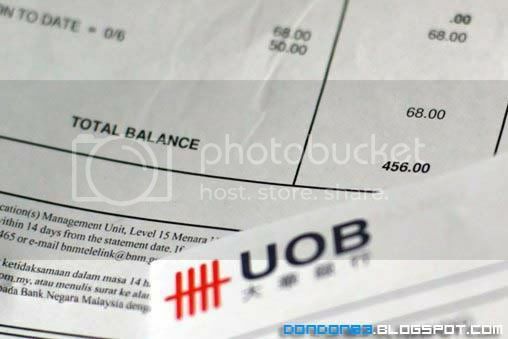 UOB : "... i tough you calling to ask for credit card statement?" DON: "yah, that's My point, i don't have UOB Credit Card, but i received a credit card bill, i need explaination on this"
UOB : "can i have you IC number sir?" UOB: "Did you applied our UOB Credit Card before?" DON :"(thinking) erm.. yeah.. i remember i did, but i never activated it, how can i received a statement collecting annual fees? don't tell me the card annual fees is RM456?" UOB :"Let me Check for you sir"
UOB: "Thanks for waiting, regarding to your statement, RM456 is sum of Annual Fees and UNACTIVATED charges"
DON : "sorry?? UN-ACTIVATED charges???" UOB : "yes Sir, you're right"
DON : "what right do you have to charge me that? i didn't activate your card because i don't want to use it, and now you charging me for didn't Activate the card?" DON : "few months back i being FORCED to apply your bank credit card, and now i being FORCED to pay annual fees and UN ACTIVATED charges." UOB : "Sir, you have to cancel your credit card if you don't want to use them"
DON : "but i don't event have it!!! i even not activate it yet, what happen if you client never receive your credit card, then you straigh away you send them a credit card statement?" DON : " i though activate the card mean a CONFIRMATION received the card and DECIDED to use it, but now you do it the others way?" UOB : "Sorry Sir, but that's the procedure... card cancellation is a must to permanently cancel it"
DON : "Okay, fine, please cancel the card for me now." UOB : "Sorry sir, can't be done." UOB : "you must write a letter and fax to our credit card department"
DON : "...... do you accept e mail?" UOB : "No Sir, they only accept Fax. and our fax number is (fax number given)"
UOB : "and the bill will be reverse once the credit card been cancelled"
DON :"(you think i going to pay for that?). oh that's good. how i know my card being cancelled?" UOB : "you will be received a statement regarding balance reverse from credit card department"
UOB: "anything i can help you sir?" DON: "no more, thanks and bye"
This sux... do you still need to pay that rm456? omg! how could it happened?? by the end,u still need to pay for it? MisSa : just raftly recall only, connversation is something like that.